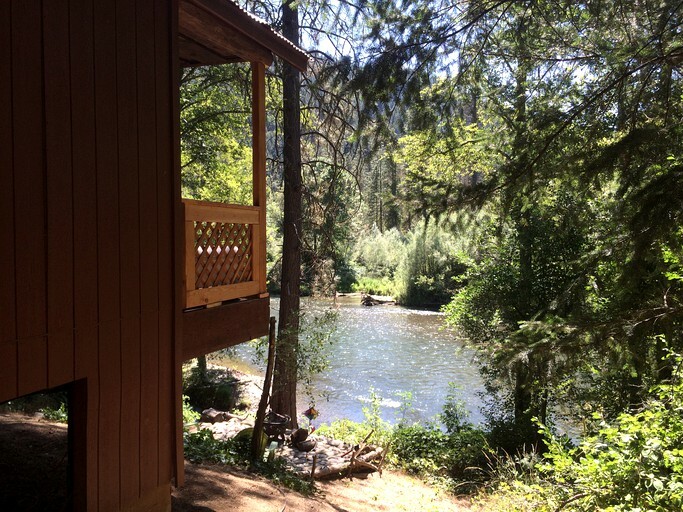 This magical little cabin is set off by itself in a grove of pines and perched just a few feet from the beautiful Trinity River. It is a real, restored miner's cabin, but with indoor plumbing, electricity and other amenities not available to the original inhabitants. The joinery used throughout the interior is rustic and attractive, and although the bathing and cooking facilities are limited, they cover the basics well. There is a sink, toaster oven, microwave and a large, deep electric skillet. Coffee drinkers will appreciate the single-cup coffeemaker, complete with coffee pods, creamer, and sweeteners. 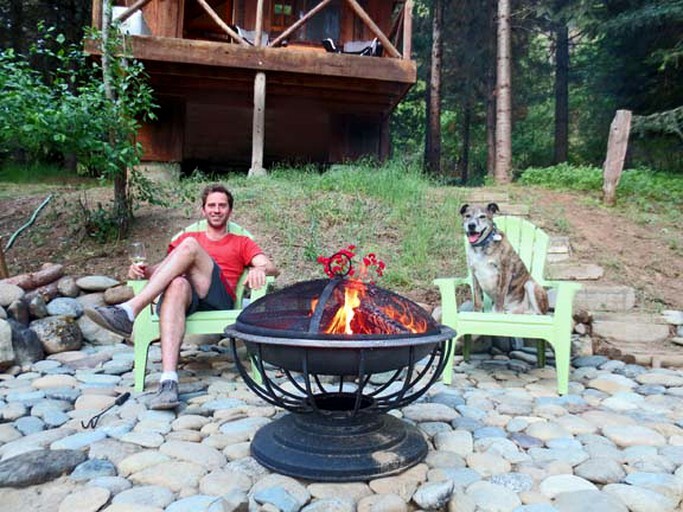 Utensils, dining and serving ware for cooking inside as well as out at the fire pit and barbecue are all included. 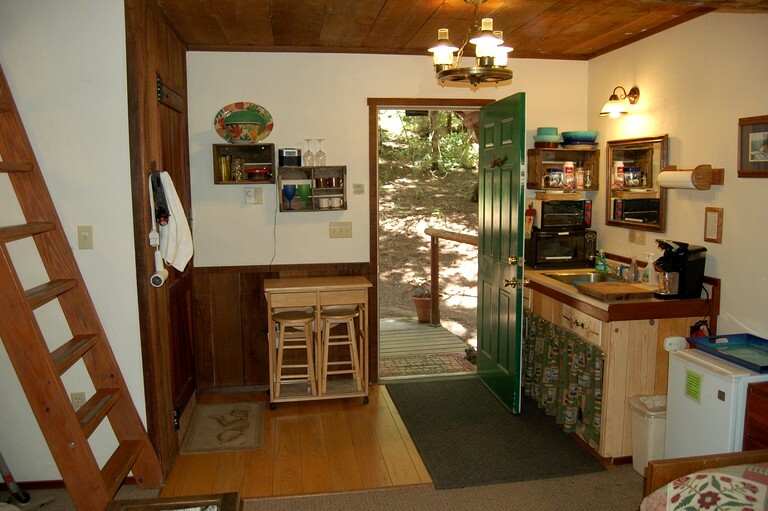 Guests can keep their groceries cool with the dorm-sized refrigerator located inside the cabin and outside on the covered porch there is a large cooler with frozen one-gallon water bottles. The bathroom consists of a roomy shower and a toilet as is found in some boats and trailers. 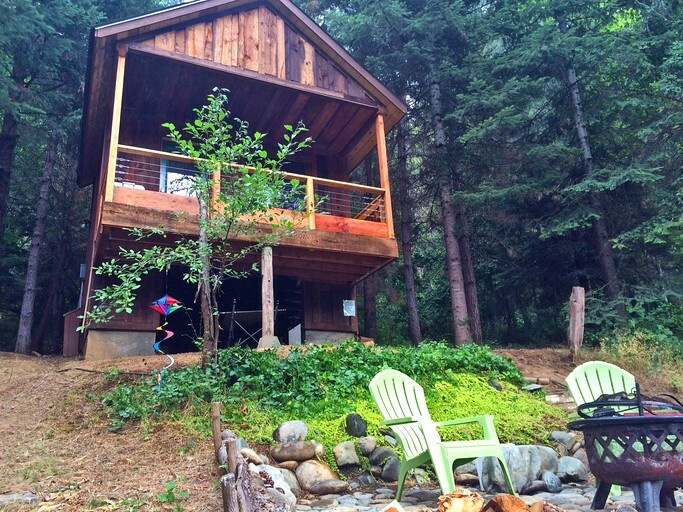 This cabin comfortably accommodates two people but can sleep up to a maximum of three. 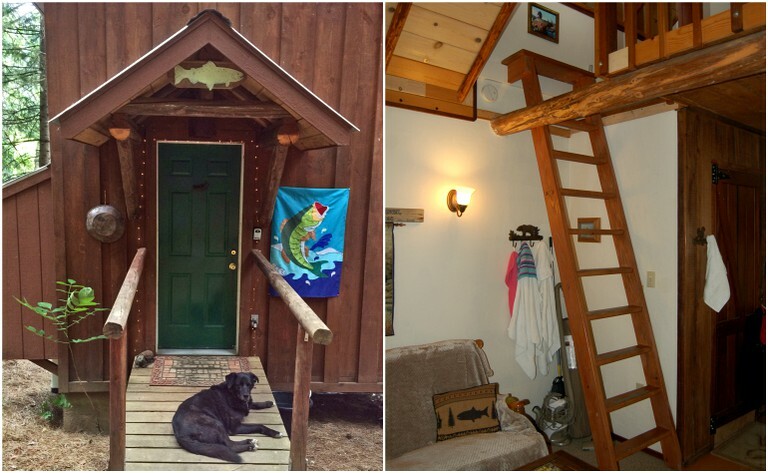 There is a comfy queen-size bed in the loft, which is reached by a wide, fixed, slanted ladder, and an oak twin captain’s sofa bed in the living room that can sleep one additional guest. The main floor also has a double rocker, a small dining set, as well as an old trunk that serves as a coffee table and houses board games. Cool antiques and nice touches can be found throughout the cabin. 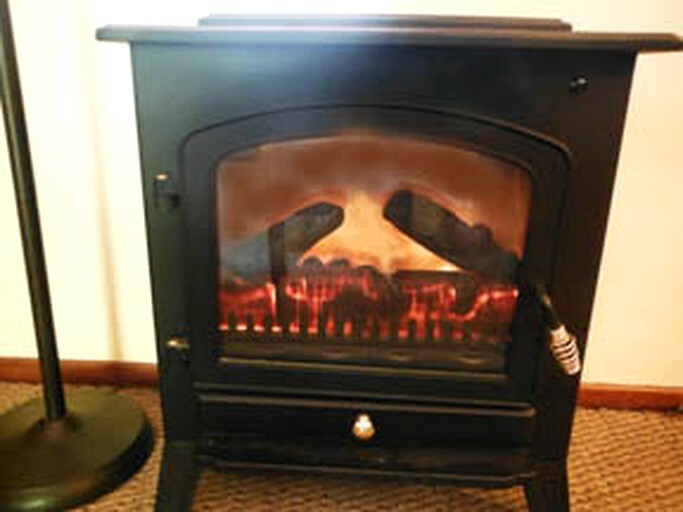 The cabin is well-insulated; in winter, a faux Franklin woodstove heater provides warmth and ambiance, with heat being augmented by a baseboard heater. Summer cooling is aided by a small swamp cooler and ceiling fan. 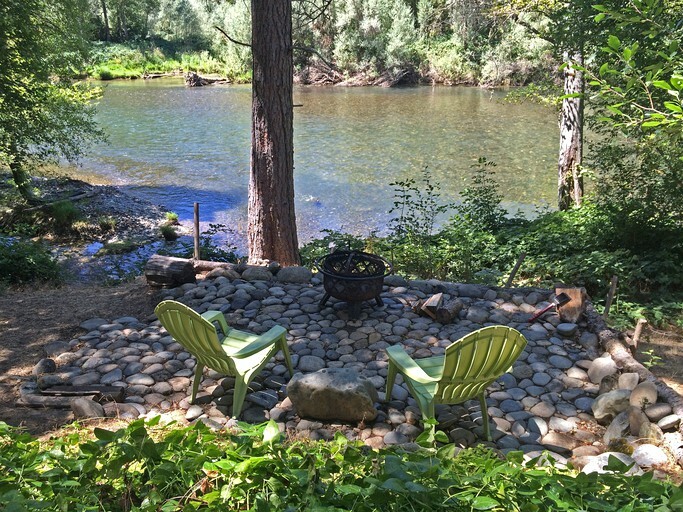 A lovely river rock patio sits between the cabin and the river. It has comfortable chairs, a serpentine rock table, fire pit with a barbecue grate, and a spot to set up the checkerboard table found up in the cabin. A starter supply of firewood is provided. 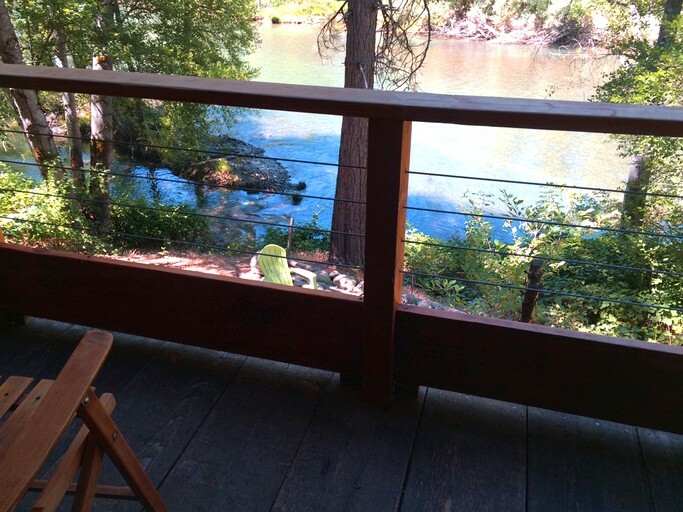 There is also a folding card table stowed below the river porch. Guests also have use of the Weber barbecue on the patio located between the other two cabins on the property, less than a minute away. This site is ideal for small weddings, events and family gatherings. 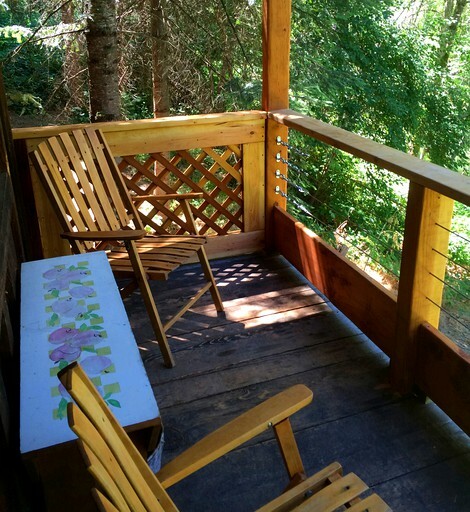 Special arrangements must be made for whole-site functions and may include the rental of outhouses for day guests as well as additional fees. The cabin has use of a shared telephone. It also has Wi-Fi, but the best reception will be found outside or up the trail closer to the larger cabin that houses the router. 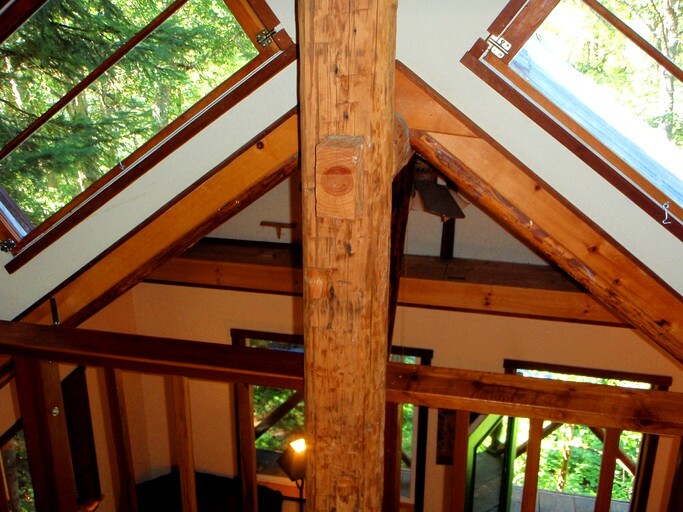 Guests may park in covered parking just up from the cabin and if they have a boat or other vehicle, they can put them in a large parking lot at the entrance to the property. 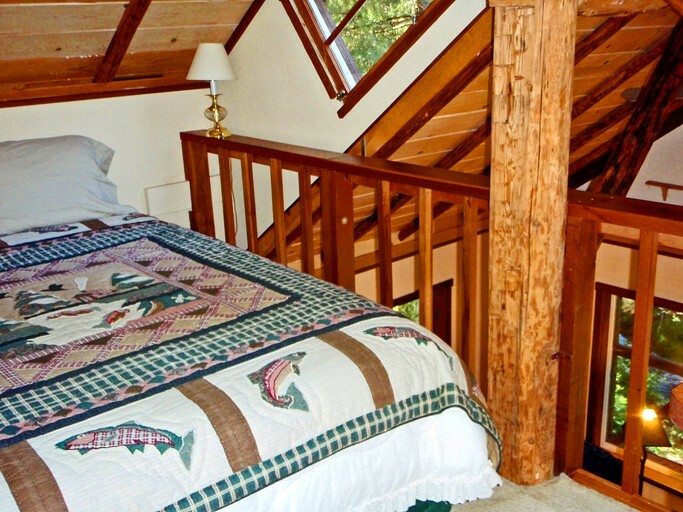 This romantic cabin is an ideal getaway for couples, although the twin captain's bed on the main floor is perfect for a kid. Photographers will capture marvels every direction they look! 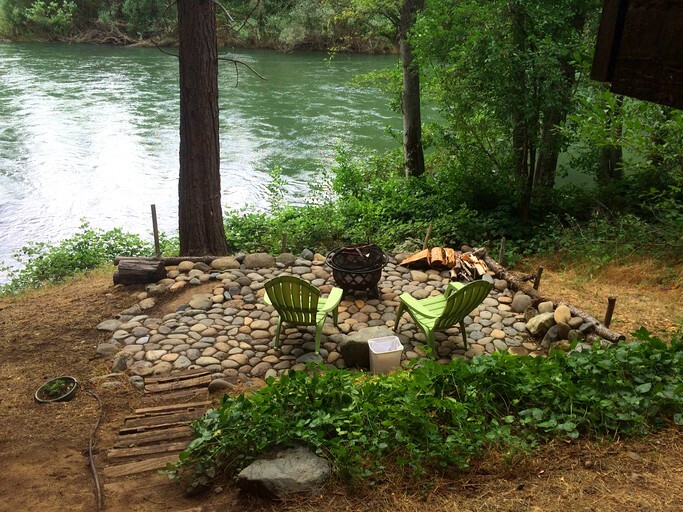 Guests can read, write, play board games, or cook over the barbecue and fire pit on the river rock landing. 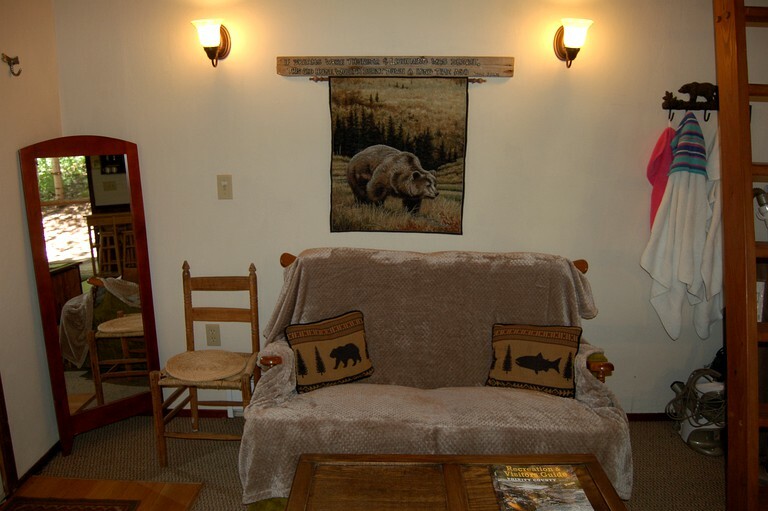 Guests can also sit on the covered porch or landing and look for fish and river otters in the water where a family of otters lives just across the river and can be spotted early mornings and at dusk. 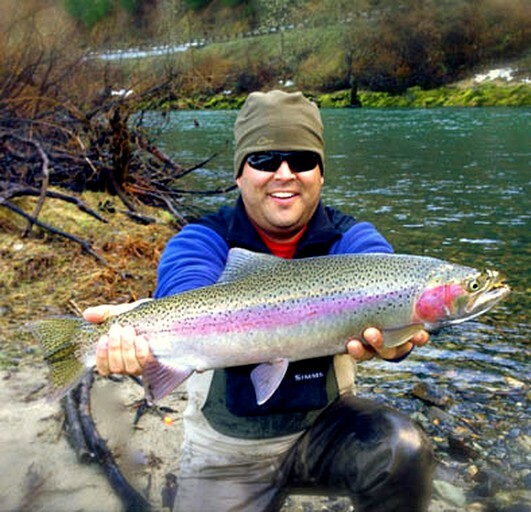 In the fall, guests will see salmon digging redds where they lay and bury their eggs. This is fascinating to watch and happens every year mere feet from the shore by the cabin. 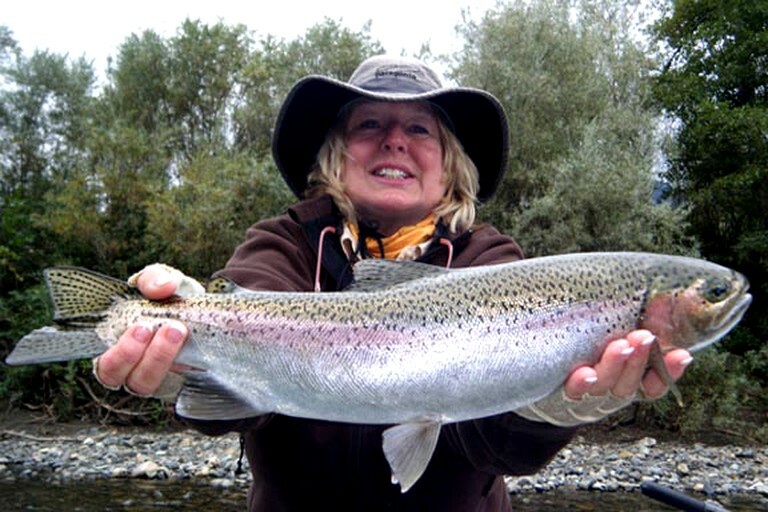 Other activities include watching the birds above ranging from bald eagles and osprey to ravens and kingfishers, or fishing for rainbow trout, German brown trout, steelhead, and salmon. 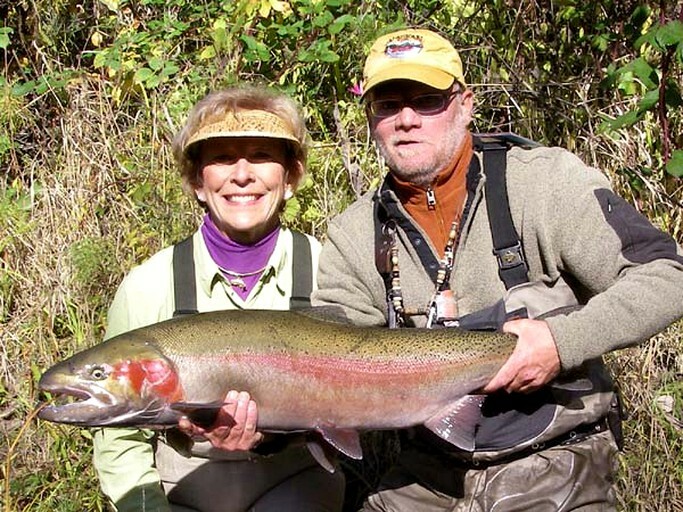 A popular steelhead riffle is within wading distance of the cabin. 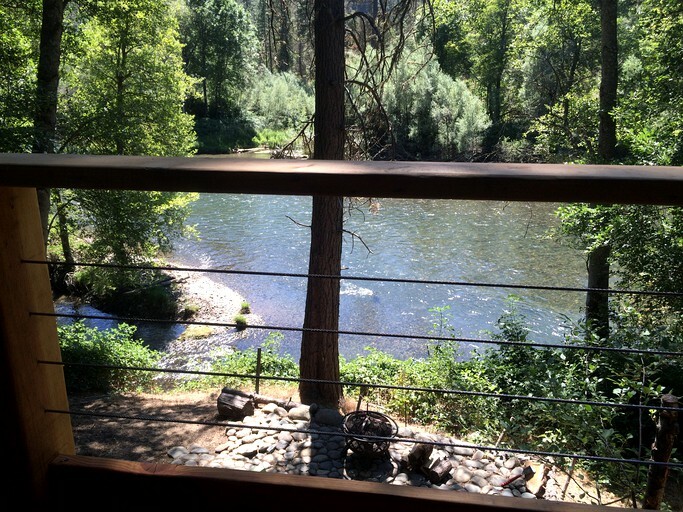 There are hundreds of trails in Trinity County that are perfect for hiking. 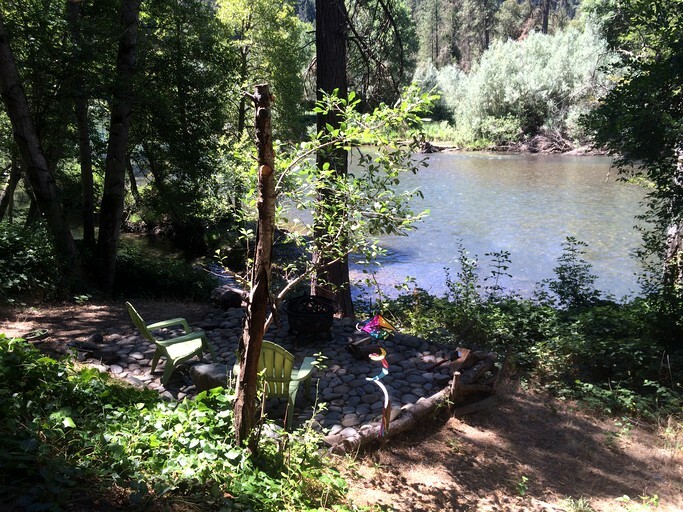 If guests are feeling adventurous, they can hike up the Trinity Alps with their jewel-toned pristine lakes. The most popular hiking destination in the area is Canyon Creek, and it's a marvelous place for backpacking. 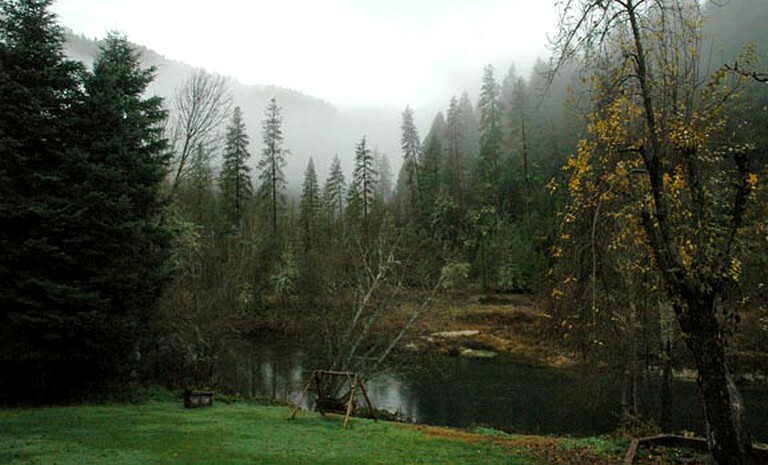 Mountain bikers will find Trinity County is their definition of heaven. In fact, the World Endurance Mountain Biking Organization chose Trinity County for its grueling 24-hour WEMBO Classic in 2015, and there are plans for a return in years to come. Less-serious bikers will enjoy the easier routes and delight in the myriad trails just west of Weaverville. For an additional fee, guests can opt for a guided river kayak trip complete with skill-building lessons provided by the property's owners. (One of them is the only person in the world to have paddled a sea kayak down the coast from Victoria, British Columbia, Canada, to Ensenada, Baja California, Mexico!) Guided and self-guided raft trips are also available, as are SUP (stand-up paddle board) lessons and rentals for Lewiston Lake, a beautiful lake that is host to a fantastic array of birdlife. A 10 MPH speed limit on the lake makes it ideal for muscle-powered craft. For guests with their own gear, the owners will generously share their suggestions for places to paddle. Trinity County has some excellent wineries where guests can enjoy wine tastings. Alpen Cellars Winery is by far the best and it's located at the north end of Trinity Lake. Not only are their wines fabulous, the owner is also the county's newest county supervisor. There is a $100 refundable damage deposit. Rates are based on double occupancy. There is a fee of $18 per night for one additional guest. 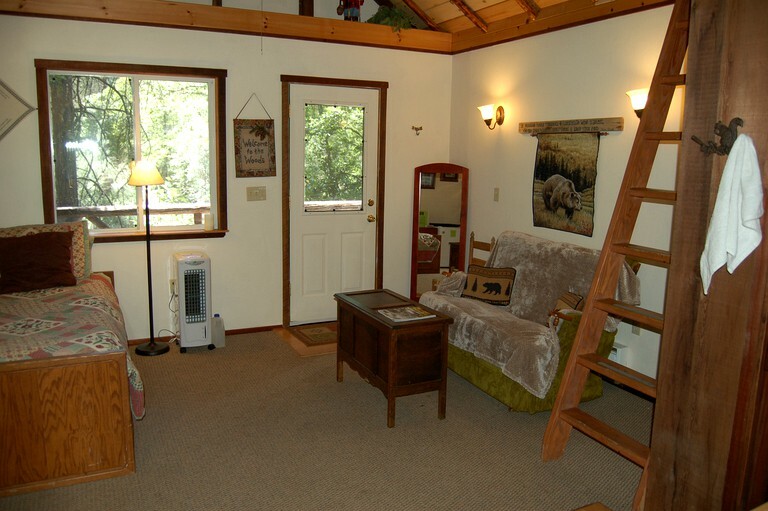 The cleaning fee is negotiable for one-night stays with minimal cooking and very tidy guests.